The dog days of summer have passed but Jack Frost isn't nipping at your nose just yet! The days may be getting shorter, but there's still plenty of time to plan a fantastic fall wedding! Autumn colors are bold, vibrant, warm and inviting making fall time a perfect theme for the beginning of your marriage adventure. By scheduling your wedding at this time of year you'll reap the benefits of off-season planning and no extreme weather. 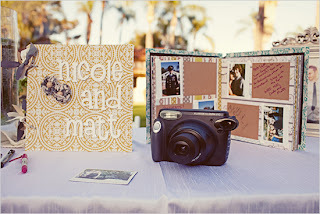 Capture every moment of your wedding day with Polaroid instant pictures and hand-written sentiments from your guests! Instant photo guest books, like Adesso's Polaroid Instant Photo guest book, buck the digital trend. When they're combined with notes from all your friends and family, the instant photo guest book becomes a valued keepsake filled with memories that will last forever! Customize your autumn-themed wedding photo guest book by using pens with gold, brown or rust-colored ink, and for added seasonal pizzazz, you can even trim the cover with ribbons in colorful fall shades. Fall Wedding Idea: Choose a fall-colored instant photo guest book that will accompany your autumn-themed wedding colors! Frank Sinatra and other singers have immortalized the romantic notion of autumn in the Big Apple. And the vivid changing colors of New England always come to mind when thinking about the season. Many locations hit the spot just right for an autumn wedding: a country inn, an old church, a vineyard, a local park and that's just to name a few! Is there a friend or family member whose big backyard has lots of trees? Remember, it's not the setting itself. It's the spirit you bring to the setting that makes your fall wedding so memorable you'll want to capture it both in pictures and in word. 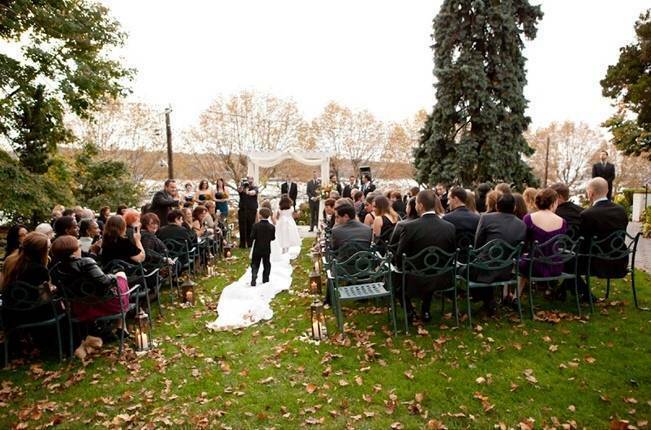 Fall Wedding Idea: If traveling out of town isn't in your budget, you can transform any venue into a fall fantasy. Look in travel or bridal magazines for fall wedding ideas, and visit your local craft store to find faux flowers, foliage and other items to help with inspiration! 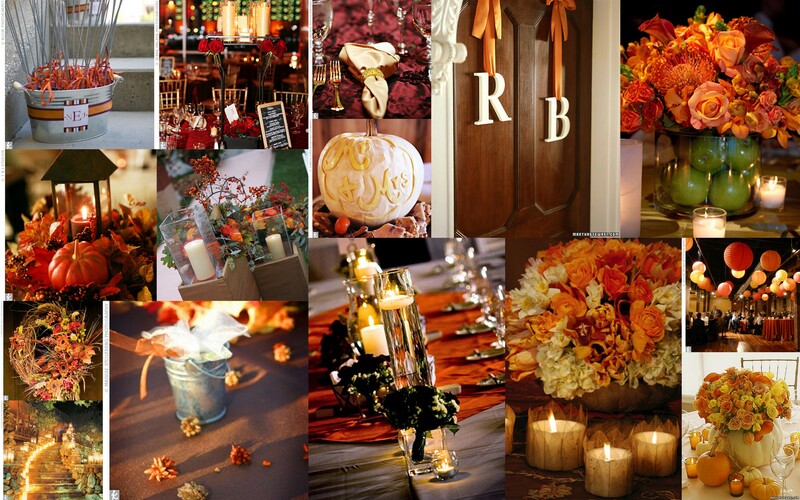 Autumn's trademark colors can be incorporated easily into every part of your wedding décor. Instead of bright white, try a gown in raw silk or a subtle cream shade? 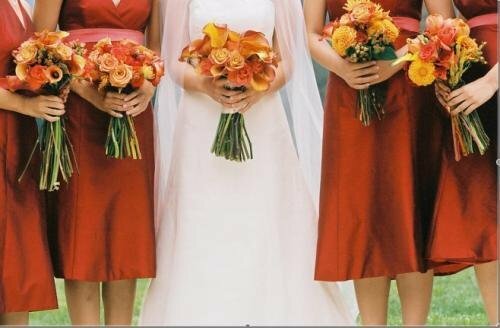 Bridesmaids and your maid of honor can wear a bouquet of lush fall shades like gold, burgundy, hunter green or chocolate brown. Select complementary ties or vests for the groom, best man and groomsmen. If the flower girl is going to sprinkle the aisle with rose petals, use dried flowers or autumn leaves instead. Depending on the time of day, you might be able to have the ceremony by candlelight. And don't forget to decorate the reception tables with seasonally-colored linens, mini pumpkins, dried flowers, acorns and colorful gourds. Fall Wedding Idea: Assign someone you can count on to take pictures of the festive table settings before the reception to include in your instant wedding photo guest book! 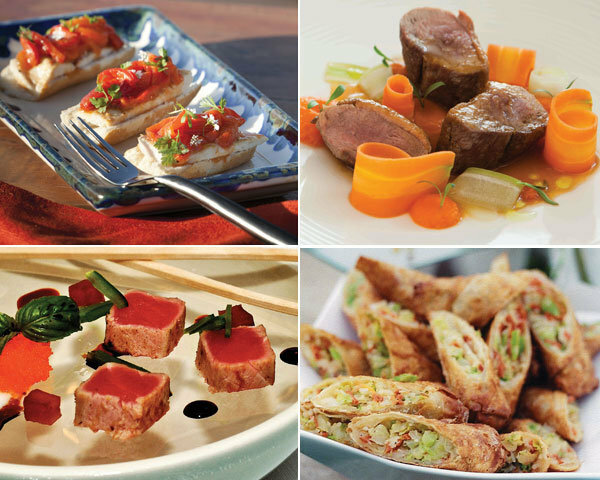 Many delicious foods conjure up images of crisp autumn days and nights. For starters, greet guests with a glass of warmed, mulled cider spiked with something festive like Tuaca liquer from Tuscany! Nuts and dried fruits can be available for nibbling before and after the ceremony. For your main course, there are the staples like a Thanksgiving dinner theme. Serve the turkey with all the trimmings or try roast chicken or Cornish hen with cranberry garnish. For more hearty fare, there's prime rib. Or be creative and try a game bird like quail or pheasant. And you can even "spice" up the wedding cake by choosing carrot, pumpkin-flavored or spice cake. If it's got to be chocolate, added seasonings will give it an extra flair. Fall Wedding Idea: In addition to serving a traditional wedding cake, you can also offer your guests dessert treats like apple, pecan or pumpkin pie. Send your guests home with some of the "flavor" of your wedding by favoring them with autumn wedding favors such as sachets and potpourri in seasonal scents. If there's a farm stand or local specialty shop in the area, give a jar of homemade jam, preserves or chutney. Scented fall-colored candles are sure to be appreciated and enjoyed. And since your wedding is all about the future, you can give your guests something to look forward to: flower bulbs that will bloom next spring. When it's time to wrap it all up, package the autumn-themed wedding favors in a fabric bag (muslin, burlap, calico-designed cotton) tied with a raffia bow. 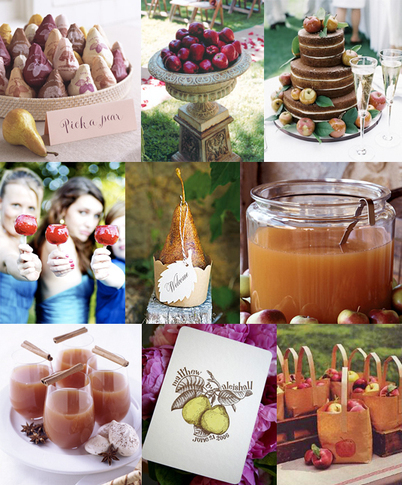 Fall Wedding Idea: How about an autumn wedding favor that's good enough to eat? Thanks to the Internet, it's easy to order unique, custom-made sweets, like jelly beans in fall colors or personalized M&Ms.